It is with a heavy heart we had to bid farewell to a very young darling. An unfortunate accident involving a playpen took her away from her owner. The BW team truly hope the owner can find peace in her heart knowing that her little angel is now in a better place. We hope you can keep them in your prayers too and send them positive vibes to stay strong. This is a very unfortunate accident that we hope no one will have to go through. BW will like to share some suggestions to all rabbit owners who house their rabbits in playpen to ensure safety in your beloved little ones. 1. Consider a playpen that is made of sturdy material and cannot be easily bent. There are a few types in the market and we are aware of the following: Black, Silver Chrome, Hammer (crack varnished) and Stainless Steel. We have noticed that recent batches of black playpen are very lightweight and bendable. The Silver Chrome and Hammer are heavier and less bendable. The Stainless Steel are the most expensive and not really corrosion resistant. At the wonderland, we use mainly Silver Chrome playpens. The price is sort of in the middle range at about $10/piece (you can find them on www.beary.com.sg). We recommend a 4-piece playpen for 1 rabbit and 6-piece playpen for 2 rabbits and we will use plastic cable ties to secure them so they won’t collapse and hurt the bunnies. 2. For owners with smaller breed rabbits or rabbits who like to poke their head through the fence, we will suggest you add another layer of mesh over the playpen to prevent any accident. You can consider wire grids from Daiso/Toyogo or plastic mesh from hardware stores like Selfix or Homefix which can be easily attached using plastic cable ties. Alternatively, you can construct fencing using the wire grids to create a flexible divider for your rabbits. 3. To prevent the hazard, the easiest way is to remove the hazard. 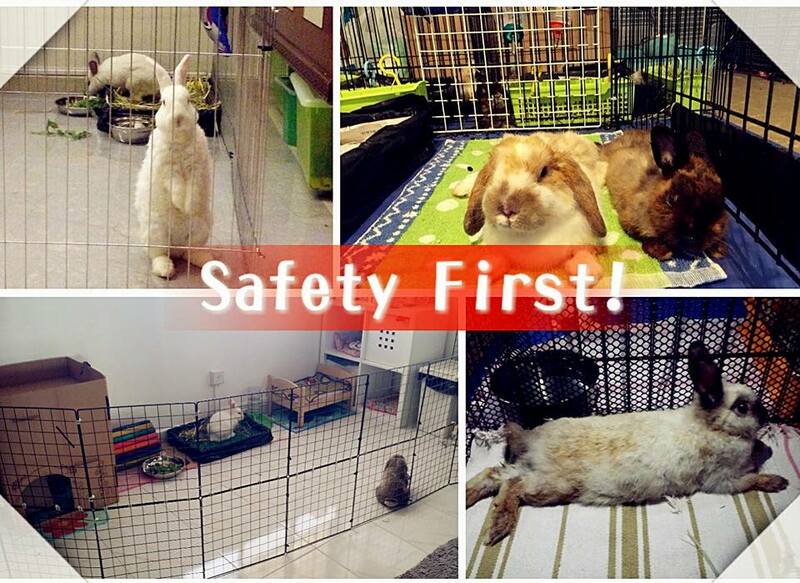 We strongly encourage all rabbit owners to litter train their rabbit and do away with the playpen all together. You can consider letting the rabbit roam in an area of the house that is rabbit proof. It can be your study room, bedroom, living room or even kitchen area. As long as you can keep it clean, well ventilated and away from direct sunlight, a free roaming rabbit can easily be happiest rabbit. Here’s a good article to help you to rabbit proof your house:http://rabbit.org/faq-rabbit-proofing/. If you have rabbits of both sexes, please consider sterilizing your rabbits before you let them roam together. The above suggestions are purely based on our experience and what we know about our rabbits. If you have any good tips to share, please comment below. Let’s work together to help more rabbits stay safe and healthy.